Ornamental cabbage and kale (Brassica oleracea var. acephala L.) are major fall crops for many growers. The colourful foliage and added height make the plants a nice compliment to fall pansies. The challenge: how to avoid leaf loss. About a dozen members of the Garden Writers Association were welcomed to a special day at this year’s Container Gardening Showcase of Sawaya Garden Trials. 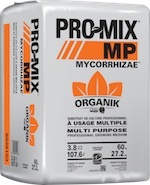 PRO-MIX® MP MYCORRHIZAE™ ORGANIK provides the perfect solution for growers in need of an organic-certified growing medium that delivers well balanced air/water qualities. OMRI-Listed and input approved for organic agriculture by Québec Vrai, this formulation is ideal for a variety of growing uses and is designed to meet crop requirements for certified organic growers. Highlights of this year’s Cultivate’14 show have been captured in our special digital edition. From traditional to trendy, the season's top trends are all wrapped up in our 2014 Holiday Trend Report.